If you take a cursory glance around a carpark these days, chances are, you will have noticed charging stations for EVs. Some carparks take the love for EVs a step further and even have designated spots for EVs. It's obvious that a silent revolution has begun brewing around personal transportation in NZ and it just may be happening sooner than most had anticipated. There are now approximately 9000 EV drivers on NZ roads and this number is growing fast. The competition among EV makers itself has begun to heat up to a point where it probably won't be an 'if' but a 'when' that the EV revolution garners critical mass. If you are among the many who have considered getting a new car especially a second car or if you're on the fence whether an EV is the way to go then this blog post may help you decide. When I first started to look for a new car, I, like most other drivers, was tempted to ride the transitionary phase between Petrol and Electric out by purchasing a hybrid before getting down to my dream of picking up an EV. It took me a lot of research and test drives from a few dealers before I was completely sold on an EV. I'm convinced that now is as good as any for those considering making the switch to an EV over a gas guzzler or even a Hybrid. To begin with here's both the Pros and Cons of making the switch to an EV. The fuel running cost of an EV is the equivalent of paying $0.30/L, or approximately 15% of the cost of running an equivalent sized petrol vehicle. With most driving distances between Auckland city and it's suburbs within a 25 km radius, driving to office and back could potentially end up saving you approximately $200 per month versus a standard ICE (Internal combustion engine). That translates to savings of $2400 per year. This multiplied over the lifetime of the car battery could potentially give you your return on your investment in fuel savings alone over! In addition to fuel savings you will also save big on maintenance. EVs have just 18 moving parts when compared to 4000 in an ICE which means no changing of spark plugs, oil filters and those clunky spare parts that give you a bill shock after you pick up your car from a mechanic. Maintenance of your EV is reduced to just tyres, brake pads and wipers. If you're committed to the future of the planet and/or have realised that it's simply not sustainable to burn millions of tons of oil buried for millions of years in a few decades without playing havoc with the planet, then this alone could be a good reason to make the switch. The consequences of our poor choices are now clearly discernable. We are seeing visible effects of climate change and some of the worst pollution levels ever seen on the planet. In NZ, 80% of our electricity is produced mostly from renewable sources so when you go electric you make a direct impact on oil consumption. The government has even set a target to get all electricity from renewable sources by 2035 which sweetens the incentive to switch over even more. This move towards renewable will not only play a significant impact on the climate and pollution levels but also potentially saving the country $2 billion dollars per year in oil imports. This would also boost local employment once the need to set up and maintain infrastructure geared towards producing renewable energy kicks up a notch. Many car enthusiasts have chimed in saying there's no joy in driving an Electric car as it can't replicate the joy of hitting the gas of a V8 ICE. That's probably because they never stepped on the 'virtual gas' of an EV. This alone could convince a Petrol-head to go electric. The torque generated from an electric motor transfers directly to the wheels with minimal loss in efficiency, unlike its clunky ICE counterparts. This means the acceleration on an EV simply can never be matched by an ICE. Tesla even has a 'ludicrous' mode in the P100D model that highlights it's acceleration. When you press the brakes in an ICE the brake pads wear out from the friction of contact with the wheels. In an EV, braking energy is instead transferred back to the battery through a process called regenerative braking. This extends the range of the vehicle even further. There are brake pads in an EV but they are seldom used unless required. This minimises requiring to change your brake pads as much as an ICE. EVs are incredibly silent, so silent in fact that they actually include a fake engine sound to warn pedestrians that the car is moving. Once the silence grows on you, you'll never want to settle for the whirring of a combustion engine again. Imagine being able to listen to your music just the way it was intended to sound without the whirring of an ICE in the background. When idling in traffic ICEs continue to consume fuel, on an EV there's virtually no impact of sitting idle or moving along at a snail's pace. In fact, going slow is actually an advantage. An average speed of around 30km/h will give you a greater range than if you were driving at 100km/h due to minimal impact of wind resistance at lower speeds. The government incentivised EVs which included trial usage of the bus lane for all EVs and no on-road costs. There is an increasing incentive for the government to play a part in helping lead this switch. The biggest peeve for anyone wanting to switch to EV is driving range and with good reason. The range of EVs can be unpredictable. EVs sport what is popularly called a 'Guessometer' with an associated condition that EV driver's deal with called as 'range anxiety'. It's an estimate of the distance you can possibly drive rather than the actual hard number (kms/miles) that shows up on the display. In reality, the driving distance is affected by a lot of factors including driving style, topography, battery health and more. The range that you get with a recommended 80% charge in a Nissan Leaf charge is roughly around 73kms which should cover the driving distances between most NZ suburbs. Planning stops at charging points along a long route is a must. The last thing you want is to do is go on an unplanned long distance trip without a planned charge stop and end up hitching a ride from an ICE to where you want to go. The only way to get your stranded EV moving again is getting your vehicle towed to the nearest charging station. This is where the strong infrastructure of the ICE and the portability of petrol gives an ICE an advantage. In the future, car rescue services should include emergency charging devices to get you moving but that's not available at present. Thankfully driving range anxiety is set to become less of a problem almost every month as charging station infrastructure grows rapidly. A planned break a fast charge can get you ready to go the distance in just 30 minutes. There is even a mobile app for iOS and Android called Plug share that lets you know where the nearest charging stations are and allows you to plan and break up your trip for long distances. Almost all newer EV cars have a range of approximately 250kms with Hyundai's latest model the Kona have a driving range of 400 kms while the Tesla S and X models have a range of an incredible 600kms. Battery degradation is a reality for EVs and especially with second-hand cars. All models will have their range reduce over time. One of the most common EVs on our roads, the Nissan Leaf, has an average 2% to 4% loss of range each year. A few battery refurbishment services have sprouted up and are able to do a full battery replacement for $9000. However as NZ doesn’t import batteries, most refurbished battery packs are taken off existing cars. This refurbishment cost should come down over time and by the time the EV gets to this point where it needs a refurbishment it would have earned back the cost of the car in fuel costs alone. You can choose from a wide range of EVs depending on your budget and it can span all the way from a pricey Tesla Model S to a second-hand Nissan Leaf. If you're looking to purchase a really good EV second-hand on a budget, my recommendation would be to go for a Nissan Leaf. An increasing number of dealerships have begun importing them and the prices can vary widely so it pays to shop around. Listed below are a few pointers to look for when buying a second-hand Leaf. To get a full overview of Nissan Leaf, their comparison over generations including charging ports head to this article here. When buying a second-hand ICE car the benchmark metric for calculating value is low kms, however for a Nissan Leaf, you need to look at the number of bars on the dashboard. The bars indicate the life and health of your battery. A model that has around 10-11 bars will give you a good lifespan as well as bang for your buck. When purchasing a Nissan Leaf from your dealer, make sure you get the dealer to give you the 'LeafSpy' report. This is your battery 'State of Health' (SOH) which is the most important metric of battery health. The higher the better. A Leaf with 12 bars, will have a SOH of at least 85%. It roughly works out to be 6.5% SOH for one bar of battery. If you want to go a bit deeper and track your battery performance yourself over time, you can purchase an OBD connector from Ali Express that connects into the car dongle and interfaces over a Bluetooth connection with an app called 'LeafSpy'. You can also submit this data regularly to Flip the fleet a non-profit initiative created by NZ citizens that help track battery performance of EVs over time. There seems to be some confusion over Generation version nomenclature among dealerships. They consider Generation 1 cars to be anything pre-Nov 2012 (2013) and Generation 2 cars post this date. In reality both these are 24KW models that have a number of differences in the features and a significant cost differential between these two variants. A generation variant was sold in September 2017 and is the 30KW model. The 30KW model was reported to have a bug in the software that seemed to indicate a higher battery deterioration than the 24KW. This bug has since been fixed with a software update. My advice would be to go for cars post-2013 as there is some evidence that the battery degrades much less. You can charge your Leaf through a standard NZ plug or through quick charge charging stations. Make sure your dealer gives you an NZ version of the Level 1 charger. You can charge it at home through a standard charging point and the charge time is usually overnight. Charging stations have a quick charge CHAdeMO fast charger for your Leaf that can get the car charged and ready to go in 30 minutes. To get more information scroll to the section on charging in this article here. As you'd expect from a Japanese second-hand car, the display is in, 'Japanese'. 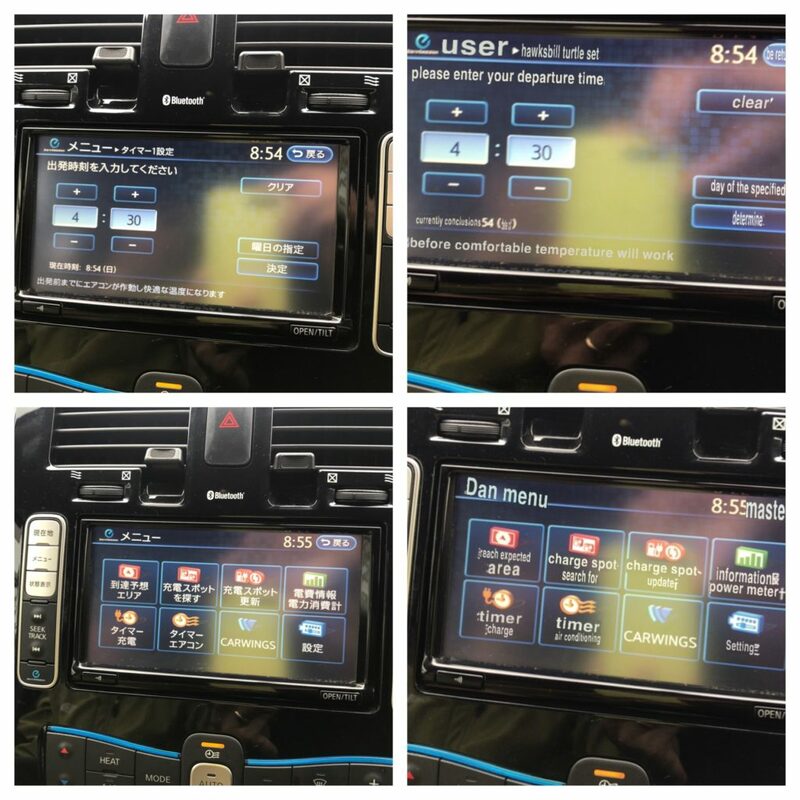 The best way to get around this and get your car setup is to download the Google translate app and use the camera to do a Japanese to English translation to set up the car. I would highly suggest setting up the car before you actually start driving it. There are a number of settings that once set up will optimise your car performance and usage. The settings include being able to run climate control and preheat your car while it's plugged in before going out on the road. This will save you on battery power required to heat the car from cold. In addition, Nissan recommends charging your car to 80% of its capacity to lengthen the lifespan of your battery which is another setting that can be configured. If you already own one ICE and looking for another car I would highly recommend you go for an EV. You will have the best of both worlds a cost-saving daily ride and a car that can go the distance if really required. For more, watch these videos on electric cars. Happy EV driving!